With a handsome Black faux leather top and stylish chrome legs, the Studio Designs Executive Craft Table makes a lovely addition to any room in the house (not just the work room). It boasts four removable side trays for holding supplies, and the surface tilts to any angle from flat to 50°. The base is constructed of heavy gauge steel for durability. 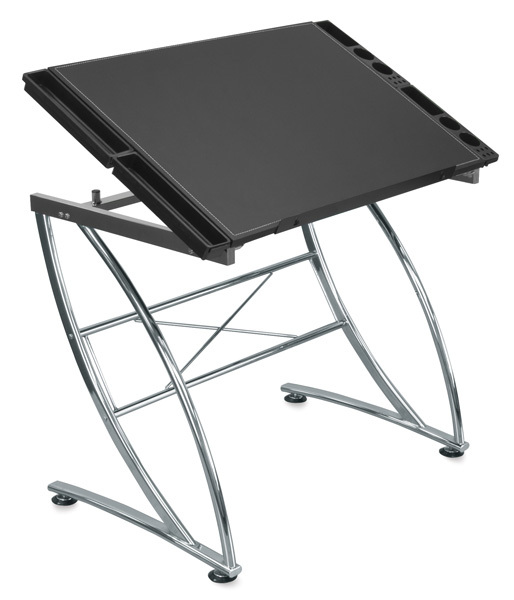 The main work surface measures 36"W × 23¾"D. With the side trays, it measures 41½"W. The height of the table is adjustable from 30½" to 47" at full tilt.